Mazda claims that the new Mazda2 will “set new standards for infotainment, in-car connectivity and equipment levels in the segment,” when the Fiesta rival hits the shops early next year, priced from £11,995. That claim is given credence with the announcement that it will be the first B-segment car available with a head-up display, while mid-level cars upwards get a seven-inch colour touchscreen as standard, including DAB radio and satellite navigation. The range will start at a fiver under £12,000, Mazda has announced today, which will buy into the first of five trim levels: SE, SE-L, SEL-Nav, Sport and Sport Nav. The last of those is priced at £17,395. 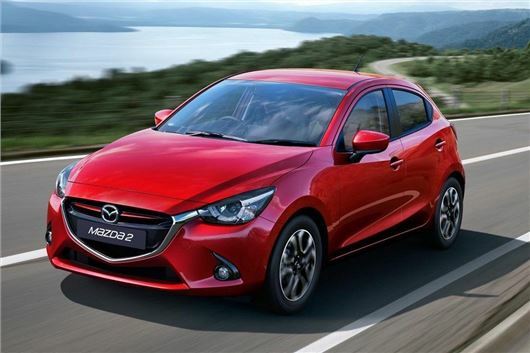 Mazda2 models at the bottom of the trim spectrum sit on 15-inch steel wheels, although do come with daytime running lights and electrically adjustable door mirrors. For a set of alloys SE-L trim is required, which also heats the door mirrors and adds front fog lights, and on the inside it wraps the steering wheel and gear knob in leather. It puts a 60/40 split in the rear bench and allows phone connectivity via Bluetooth, too. And with moderate power comes additional responsibility, because only SE-L models with 90PS or above qualify for the aforementioned seven-inch touch screen. That rules out those powered by the 75PS version of the 1.5-litre petrol engine. On powertrains, there are essentially two engines available – a 1.5-litre petrol and a 1.5-litre diesel – although the petrol unit comes in three power outputs: 75PS, 90PS and 115PS. The diesel is 115PS only. With all the possible variations of those engines and five trim levels, there are 16 versions of the Mazda2 from launch, including a 90PS Sports Launch Edition, which at £14,995 is the same price as a Sport but adds 16-inch alloys, privacy glass, rear parking sensors, and automatic headlamps and wipers. All engines are Euro 6 compliant, with the most efficient the SKYACTIVE-D (diesel) 1.5-litre, which returns an impressive 83.1mpg average, equalling 89g/km. The 1.5-litre SKYACTIVE-G (petrol) 115PS returns 56.5mpg. The 90PS petrol returns 62.8mpg and 105g/km, though with the optional automatic gearbox that dips to 58.9mpg and 112g/km. Safety equipment includes the usual braking and stability mechanisms now filtering into the smallest cars - brake force distribution, dynamic stability control and hill hold assist, to name a few - while from the Sport Launch Edition upwards, city brake support (automatic braking at speeds up to 19mph) and lane departure warning are included too.